Ever since Isabelle was born, I've really learned to celebrate the little things. Not just the little people (which she was), but the small moments, the together time, the times we take for granted. Quite often we pay extra special attention to big events, but forget about the little moments. Before the new year started, I was looking for a way to capture all these good things that happen in our lives without having to rely solely on photographs or video. Don't get me wrong, I LOVE taking pictures. I think we took about 4000 in 2012 alone. Yes, I know; it's insane. The worst part: we've taken so many photos and haven't printed one. It's terrible. 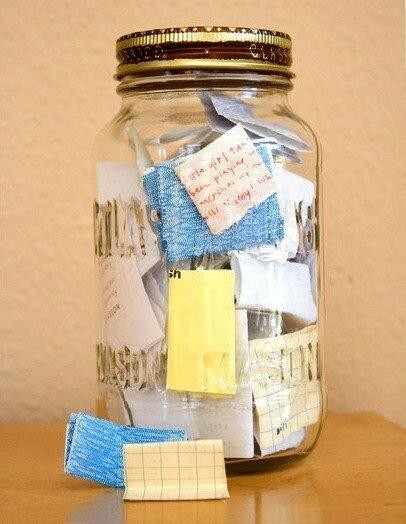 Basically, you take a mason jar and fill it with notes of good news, happenings, funny moments, memories, etc. At the end of the year, you can pull out all the notes and reflect back and remember. I thought this was a fabulous and very economical idea, so I wanted to do it, too! 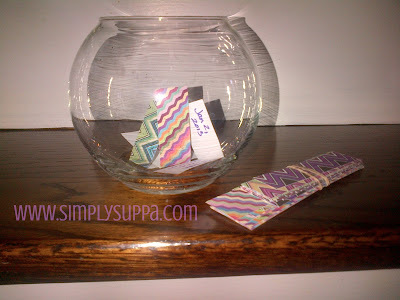 I'm not a fan of having a mason jar in my family room (I dunno - we use those for tomato sauce, so it's just weird to me), but I used a small fishbowl vase that I already had. I pre-cut some great, patterned cardstock in strips. Every time something cool happens, I'll fold the card stock, put the date on one side and the "happening" on the other. 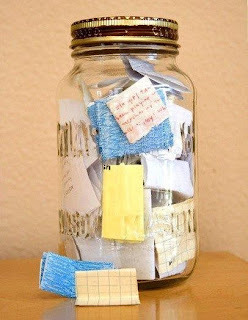 Once it fills up, I'll switch to a bigger vase, and at the end of the year, I plan on putting all these little folded flaps into a book to look back at all the wonderful moments we shared. So far, I have three things in there - and we're only a week into 2013!